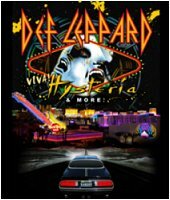 The Hard Rock Hotel have confirmed that the March 29th show of Def Leppard's VIVA Hysteria! residency in Las Vegas will be filmed. Vivian first mentioned the idea of the band filming/recording the shows for a possible Live DVD/CD package last year. He also backed up the comments in January (see Previous News link). The venue first confirmed to ticket holders in January that the filming date would be chosen nearer the time of the first show and based on ticket sales. View that message below. "The final filming date has not been established as of yet. They will base it on show sales as the date draws near as the filming equipment can take up a lot of space. We should know more in about a month or so."